This tomato sauce recipe is by far the best tomato sauce recipe I have ever made. The sauce may be a little more fiddly than some with quite a lot of preparation, but the results are worth it, a thick chunky deep-flavored sauce. The richness of the finished sauce makes it perfect for freezing, and the sauce makes a hearty base for soups (by just adding a good stock), with no addition, a fabulous sauce for pasta, grilled meats and fish. The sauce when sieved thoroughly gives a silky tomato coulis creating a more sophisticated sauce as above. One of my favourite ways to make this sauce last is to bottle it. So lovely to then open a jar in the middle of winter and be reminded of summer sunshine. This recipe can be made with fresh tomatoes, but they need to be super fresh and tasty, probably the ones you can find on the market in summer. If your tomatoes are no that fresh or bursting with the scents of summer, then use tinned. Tinned will always be preferable to anything which is less than the best. 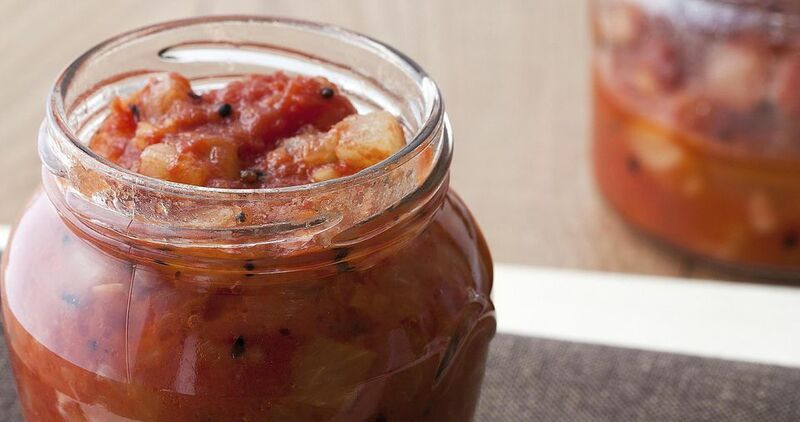 This tomato sauce recipe makes 1½lbs/ 700g of finished sauce. Chop the celery, carrot, onion and garlic into tiny pieces (1/8 inch/ 3mm), roughly all the same size. Place the tomato pieces or tinned tomatoes into a large casserole. Place the carrot, then the celery, the onion, garlic and finally the parsley and basil on the top followed by the olive oil and cook for 1½ hours, on a medium heat with minimum stirring or by shaking the pan to prevent it from sticking, and even worse, burning. To check the sauce is cooked, test a piece of the carrot and see if it is tender. If not cook a little longer. If the sauce is becoming dry, it is alright to add a little water and a dash of olive oil. Put the contents through a food mill, (or if you don't have one use a food processor but do not over blend, the sauce should be thick and quite chunky, and you should be able to see tiny bits of the vegetables within the thick sauce). Add the butter and reduce further until the sauce has thickened slightly usually about 10 minutes. Leave to cool. My favourite recipe using this sauce is a tomato tart, one you have made the sauce most of the work for the tart is done.